How do I use KingSumo? KingSumo is one of the most effective ways to grow your business. 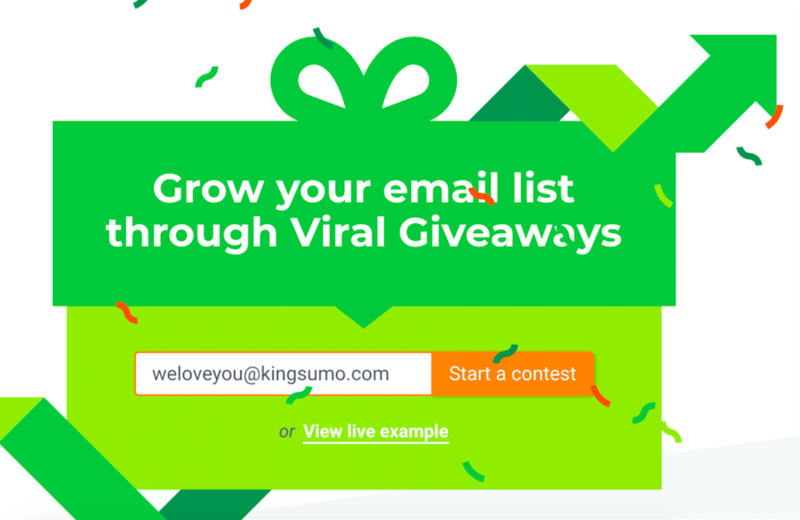 If you want more email subscribers or customers — and you don’t want to waste money on expensive marketing — using KingSumo to launch a viral giveaway can be an epic solution. Best of all, KingSumo has a 100% FREE plan. Click here to sign up (and spend that marketing budget on tacos). To get more email subscribers: New York Times bestselling author Ryan Holiday used KingSumo to get 6,144 new email subscribers. To get more social followers: The Jeff Gordon NASCAR team used KingSumo to get 2,500+ new Instagram, Twitter, and Facebook followers. To get more customers: Degree 33, a surfboard company from California, used a giveaway to get 5,351 new leads — and generate $6,482.52 in revenue! Starting a giveaway takes less than 10 minutes. To get started, enter your email address on the homepage and click “Start a contest” (it’s free). After you enter your email address, you’ll have a page to set up your giveaway. This is where you put your giveaway name, details, and description. If you need inspiration, you can click "View live example" on the homepage. When you’re ready to put a prize, we recommend you pick the prize that’s juuust right for your audience. Once you pick your prize, finish adding the prize name, prize value, and some images (max 10 MB). Don’t sweat creating a beautiful image if you have no design skills — you can use Canva. The Sharing section of KingSumo makes it easy for your entrants to share on popular social networks with one click. You can enable or disable any one-click sharing you’d like. You’ll notice a few networks — like Twitter and Facebook — are enabled by default. Gotta compete with those cat memes! 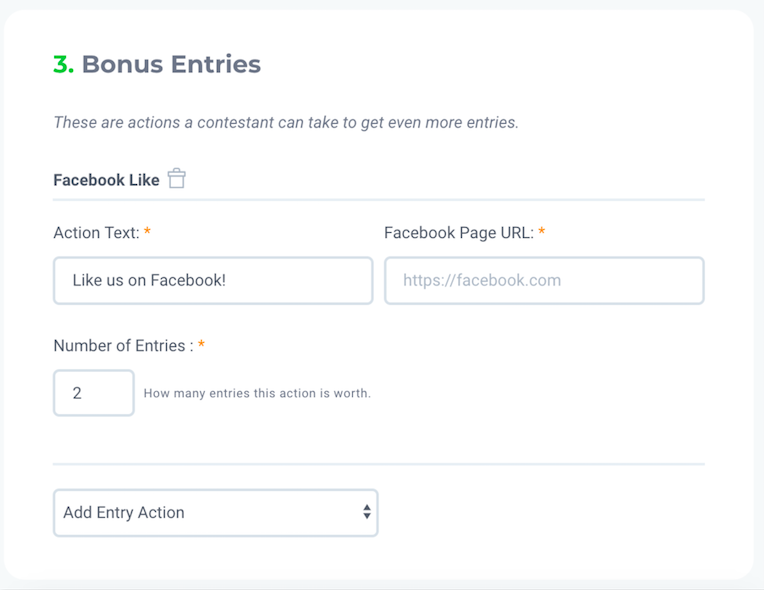 Bonus Entries give bonus entries when an entrant completes an action you want. Bonus entries are a win for your entrants they help increase their chances to win — and a win for you because you get entrants to do things you want. After your bonus entries are created, click save and your giveaway is created. Once your giveaway is live, it’s time to give it a jumpstart. 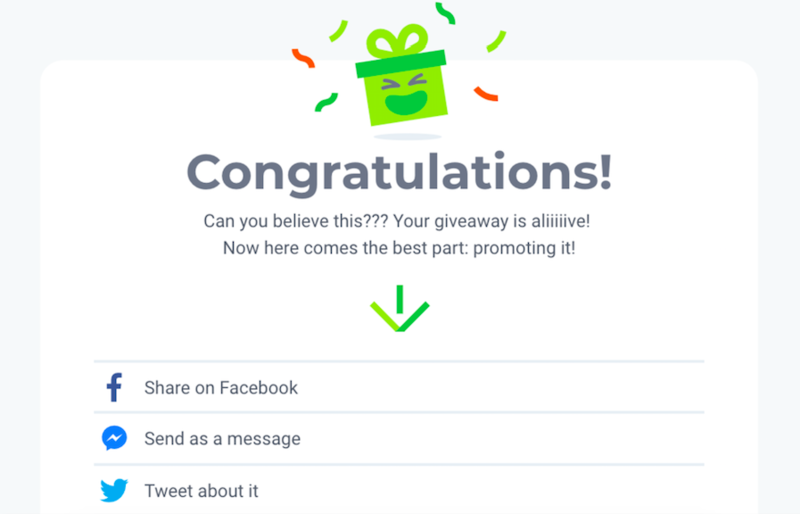 After you create your giveaway, you’re shown the Promotion page where you can promote your giveaway. We recommend you send a “launch” email to your email list and post on social. If you don’t have a big email list or social following, that’s OK — we recommend you share with friends or reach out to people you admire to help you promote. Finally, we recommend you re-promote to new friends or your social followers every few days. Go crazy! 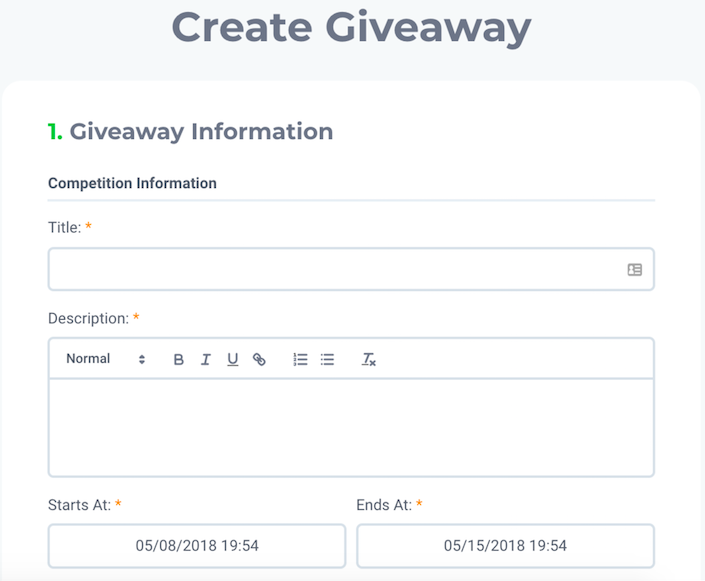 Once your giveaway is over, you can click the “Ready to Award” button on your KingSumo dashboard and the system randomly picks a lucky winner (or winners). KingSumo doesn’t automatically email the winner, so you have complete control over how and when you email the winner. And once your giveaway is over, you can export the list of all entrants and import them into your email service provider to email them marketing communications. It’s time to get going! Click here to start a giveaway with KingSumo. For more tips on how to run a successful giveaway... check out the KingSumo blog or this KingSumo case study. How much does KingSumo cost? KingSumo has different plans, including a COMPLETELY free option for anyone. If you'd like to upload your own logo on your giveaway, Facebook Pixel tracking, a full Zapier app, a more — check out our Pro plan on our Pricing page. I use the WordPress version. Why isn’t my login working for the web app? If you already have the WordPress plugin, you’ll need to register again. This new web app version is different than the WordPress plugin version. We’ll continue to support both, but since they’re two separate products you can register for each. Can I use the old WordPress version? Absolutely! If you prefer to continue using the old WordPress version, you can. We recommend the WordPress version if you want full WordPress integration. Otherwise, give the new version a try. If you want to check out the FAQ for the WordPress version, click here. How do I install giveaways? You do not need to download or install anything. Once your giveaway is saved and live, you can share the KingSumo URL of your giveaway. You can also embed the giveaway on your site. How do I resend confirmation emails? Go to "Dashboard" and click on "Contestants" for your current giveaway. You can see all the contestants and resend your confirmation emails as necessary. We’ll be adding a bulk option in the future to make this easier to bulk send. How do I remove spam entries? The easiest way to remove spam entries is to wait until your giveaway is completed, export the list of entrants, and look at their referral source. For example, many spam entries come from giveaway sites which you can identifying through the referral source and URL. We’re also working on easier ways to remove spam entries, so stay tuned. Where do I go to set up my Mailchimp and/or Zapier? Go to "Account Integrations". You’ll see the fields to add your MailChimp and Zapier API keys, which connect your accounts directly. Are you able to limit the location of contestants? Unfortunately we are not able to restrict entrants based on based on location right now. But we’re working on it! I have multiple prizes but there’s only one prize field. Where can I add the other prizes? For now, you can only give away one prize. But we’re working on allowing you to add more prizes, so stay tuned. How do I edit the rules? Right now we have a rock-solid rules page for everyone to use as default. We’ll be adding the option for you to change your rules in a later version of KingSumo. How do I embed my giveaway? Note that when users signup for your embedded giveaway the link in the email confirmation will send the user back to that embedded page. How come my contestant emails aren't being added to my list? It's also worth noting your giveaway contestants must confirm their entry and only then will their information be sent to your integration software.. I have my API setup and my field requirements are correct, but I'm still not getting data sent to my email list? 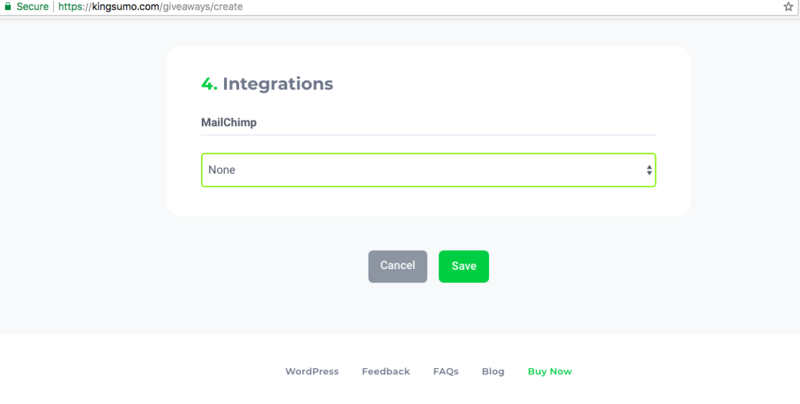 When you integrate a third-party software into KingSumo, you need to make sure you have the integration selected when creating your giveaway in Step 4 of your giveaway editor. Please view the image below and make sure you've selected a list before publishing your giveaway. I ran a giveaway, and my entrants got an email after the giveaway ended. Why is this? After a giveaway ends on the KingSumo Free tier, the system sends an email to your entrants. This email tells them they can use KingSumo to run their own giveaway. It's the only email sent after the giveaway, and users can unsubscribe anytime. If you're a giveaway admin and you want to disable this email, you can upgrade to our Pro tier. This email is disabled on the Pro tier.